A transformation breakdown from Wes Craven's monster movie Cursed. In the film, a brother and sister grapple with their new physical abilities and bloodlust after being attacked by a werewolf in Los Angeles. 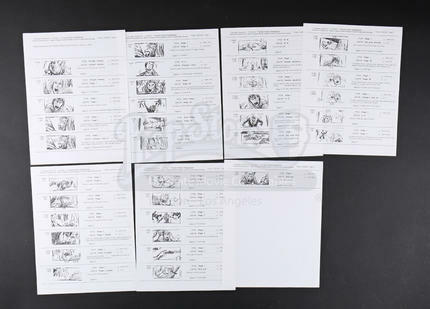 Consisting of seven pages, the transformation breakdown depicts Joanie's (Judy Greer) werewolf transformation and feature the makeup and VFX notes for each frame. The sheets are dated March 2003 and feature Joanie fighting the character of Vince, a character that was later omitted in the script's final draft. Showing minimal signs of wear, the packet remains in very good overall condition.